For those of you not in the know, thyme and corn are amazing together. Amazing. Seriously. Sure, you could just toss some dried thyme into some Jiffy cornbread mix; but trust me with this from-scratch recipe, it’s really spectacular, and could hardly be easier. Instead of relying on oil or dairy for the moisture, I’ve used a banana in this one. Maybe it sounds strange, but it really seems to work. You don’t so much taste a banana flavor as a vague hint of fruit. (And this from a girl who can’t even stand to have bananas blended into her smoothies; it always seems to overwhelm everything else.) If you really have an issue with bananas, though, you could certainly use applesauce, or a really ripe pear, or any other fruit purée you like. Ripe bananas seem to be omnipresent in my house, though, so that’s what I used. What you end up with is a barely-sweet, moist-centered, crispy-crusted muffin, redolent with the sweet flavor of cornmeal, but the fluffiness of wheat flour. 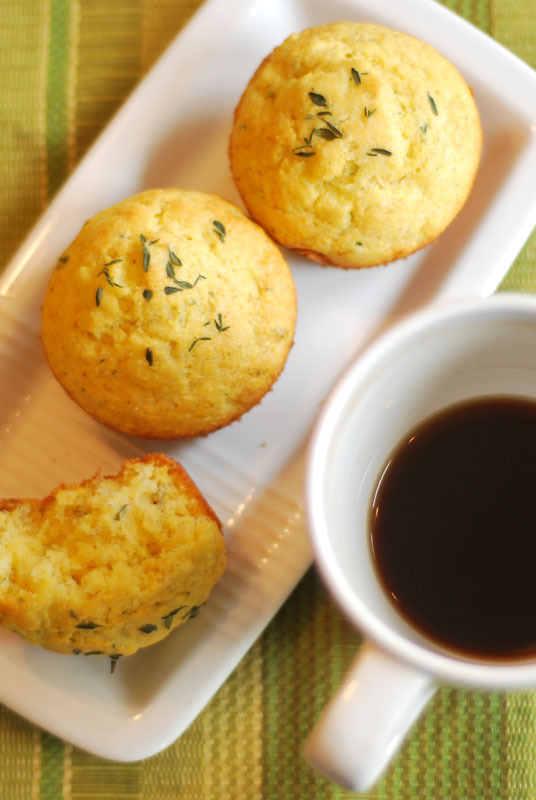 And shooting through it is the suave and herbal flavor of thyme, contrasting and complementing the muffins in perfect balance. These muffins would go beautifully alongside any fish entrée, or with a simple store-bought rotisserie chicken, or with any slow-cooked dish (vegetarian or not, either way would be just as good). They’re even apropos to serve with coffee for breakfast, if you so desire. You can see I didn’t shy away from that application – they were just perfect for a quick nibble before running out the door! 1. Preheat oven to 375º F. Grease 9 cups of a standard muffin tin, or line with paper cups. In a large bowl, whisk together the flour, cornmeal, baking powder, sugar, and 1 tablespoon thyme leaves. Set aside. 2. Mash the banana in a liquid measuring cup, and add enough milk to measure to 3/4 cup. Add the butter, olive oil, and egg. Mix with a fork until well combined. 3. Add the banana mixture to the flour mixture, and stir until just moistened. 4. Divide the batter evenly between the muffin cups, and sprinkle the remaining teaspoon of thyme leaves over the top of each. Bake the muffins at 375º F for 15 minutes, or until lightly browned, and firm when pressed lightly. Remove muffins from tins, place on a wire rack, and cool for at least 10 minutes before serving. 1. These muffins are best served warm, but will keep well for 1 to 2 days in an airtight container. Any longer than that, and they should be kept in the freezer, and thawed in a 350º F oven for 5 minutes or so. 2. If you have any reserved bacon drippings, you can (and probably should) substitute that for the butter. Delicious!